Your Wedding Day is one of the most important days of your life. We understand that there is a lot of planning and expense involved. After a very hectic and perfect day, the evening reception is a time to enjoy your special day with your family and friends. Therefore, having the perfect DJ is crucial to the smooth running of your reception. Our collection of wedding DJs are experts, with many years of experience in wedding etiquette. Our wedding DJs work to the customers briefing, creating the perfect evening for you and your guests. Your DJ will be reliable, courteous and personable, whilst taking care of everything, leaving you to relax and enjoy the evening. They will be able to mix seamlessly from song to song and will have a good strong, clear microphone voice which they will only use at appropriate times and as directed by your requirements. They will treat your wedding as a special, once in a lifetime event and always give their best efforts to create memories for you, your families and your guests. Weddings have been the very cornerstone on which our business has been built. Since our formation, we have gone from strength to strength establishing ourselves as a leading provider of wedding DJs. We also continue to be the recommended company of choice to many local prestigious venues. Our policy on music for weddings is simple. We want it to incorporate and reflect the couples’ tastes while being suitable for the broad range of ages that typically attend. For some, Abba and YMCA are a must to dance to, whilst others cringe at the thought of hearing them. At djs-essex.co.uk we always listen to and deliver your personal requirements. 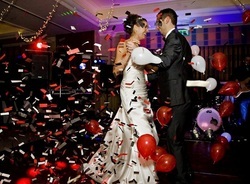 We tailor the music to your specific choices, whilst ensuring the music is suitable for your guests to dance to. We never approach a wedding blind with the philosophy of playing a “typical” wedding set. Once we assign a DJ for your wedding, we will liaise with you until the big day to ensure everything is perfect. Rest assured, you will receive the personal service you deserve on your special day.